Volunteers pulling invasive species and Himalayan blackberries. The past month or so, the other AmeriCorps and I have been planning the 6th annual weed pull for Martin Luther King Day. Last Monday we finally got to see all our hard work come together and it turned out great! MLK Day is a day of giving back and serving your community. In partnership with AmeriCorps and the Port Townsend Marine Science Center, we were able to bring 48 people from the community together and fill three very large trucks with invasive dune grass and Himalayan blackberries from the beaches here at Fort Worden. Sea Scout using all his strength against blackberry bush. I woke up Monday morning to a beautiful sunrise and no rain in sight, lucky for us... Around 9 a.m., all the AmeriCorps began our set up and run-through for the day. University of Washington's E. Virginia Armbrust is lecturer at Port Townsend Marine Science Center's Future of Oceans Series, Sunday, Feb. 11, 3 p.m.
E. Virginia Armbrust, Ph.D., director of the University of Washington School of Oceanography, will be the featured speaker in the fifth and final installment of the Port Townsend Marine Science Center's 2017-18 series, "The Future of Oceans." Armbrust's lecture, "Phytoplankton in a Changing Ocean Climate," will take place at the Chapel at Fort Worden State Park, Port Townsend, Wash., on Sunday, Feb. 11, at 3:00 p.m.
"Dr. Armbrust is known for her innovative approach to oceanography," said PTMSC Executive Director Janine Boire. "While her research focuses on the micro-world of phytoplankton, the implications of her work have an important global reach. These tiny organisms create much of the oxygen in our atmosphere. In her lecture she'll be sharing how the rapidly changing ocean climate impacts this microscopic life form." Most recently, Armbrust has identified chemical signals that form the basis of cross-kingdom communication. Her group developed ship-board instrumentation that now permits the fine-scale continuous mapping of distributions, growth rates and loss rates of different groups of phytoplankton. "Dr. Armbrust's research focuses on marine phytoplankton, particularly marine diatoms, which are responsible for about 20 percent of global photosynthesis," said Boire. 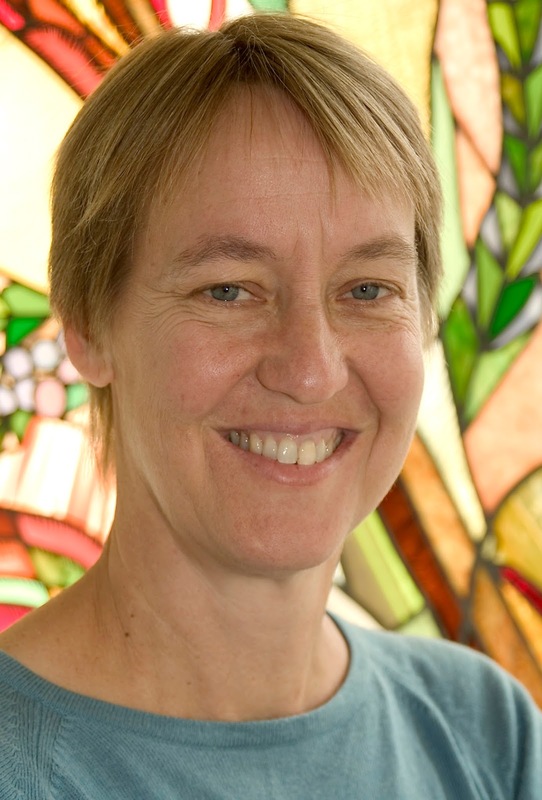 "She has pioneered the use of environmental genomics and transcriptomics, combined with metabolomics, to understand how natural diatom communities are shaped by the environment and by their interactions with other microbes." 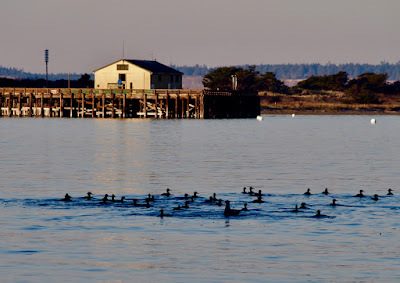 I’ve been serving as the AmeriCorps Citizen Science Educator at the Port Townsend Marine Science Center for three and a half months now, so I’m starting to settle into some familiar patterns surrounded by familiar faces (or beaks for the purposes of this blog). 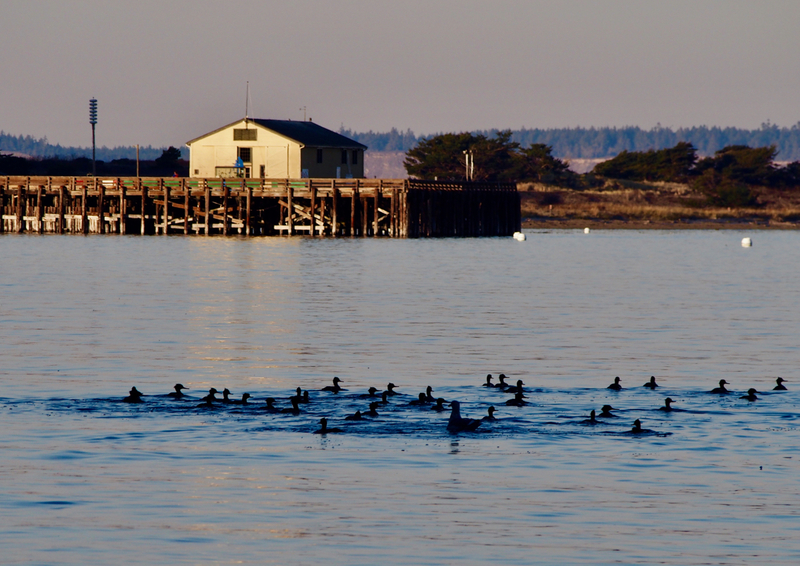 I’ve gotten used to walking out on the pier every day and sending groups of pigeons scattering in every direction. 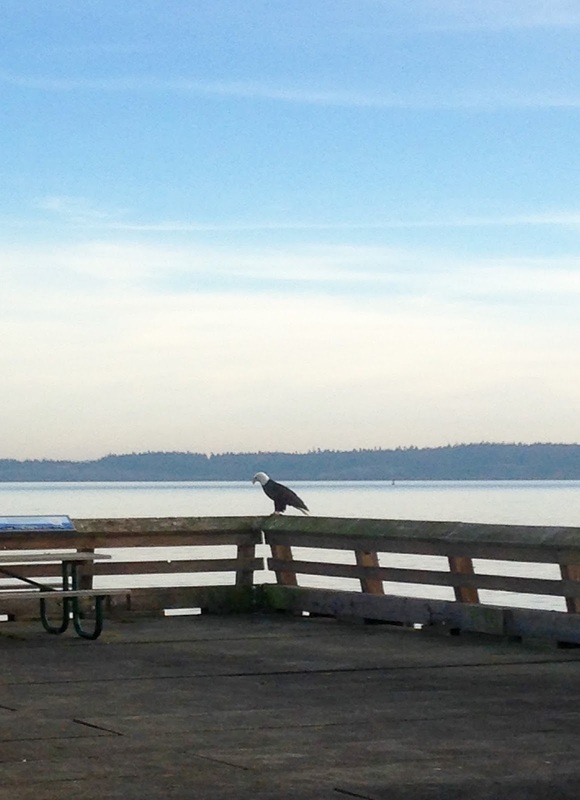 I’m used to seeing a kingfisher perched on the corner of the pier, or seeing a bald eagle flying over the water being harassed by gulls. 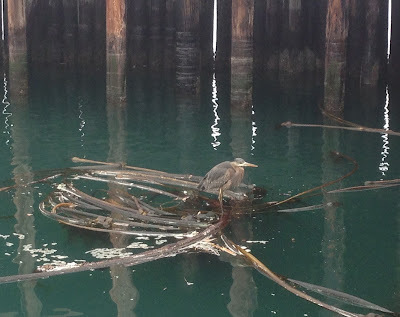 I love seeing the cormorant perched on a buoy with its wings spread out to dry, and it’s always a special treat when the great blue heron takes off from the shore squawking like a little pterodactyl. So naturally I was intrigued when I noticed some fresh faces one afternoon on my walk up the pier. They were a group of ducks who had rusty brown heads with a crest at the back. 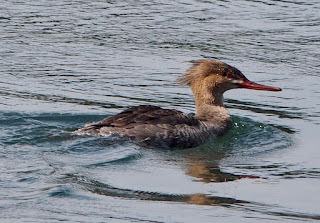 I excitedly went into the Marine Exhibit and asked a volunteer docent if she knew what kind of birds they were and she told me they were red-breasted mergansers (I learn so much from our volunteers!). I did some research and found that they are joining us for the winter after spending the summer breeding further north. I don’t usually pay much attention to the birds on the water as I’m not familiar with many of them and I find it hard to get a good enough look to make an ID. 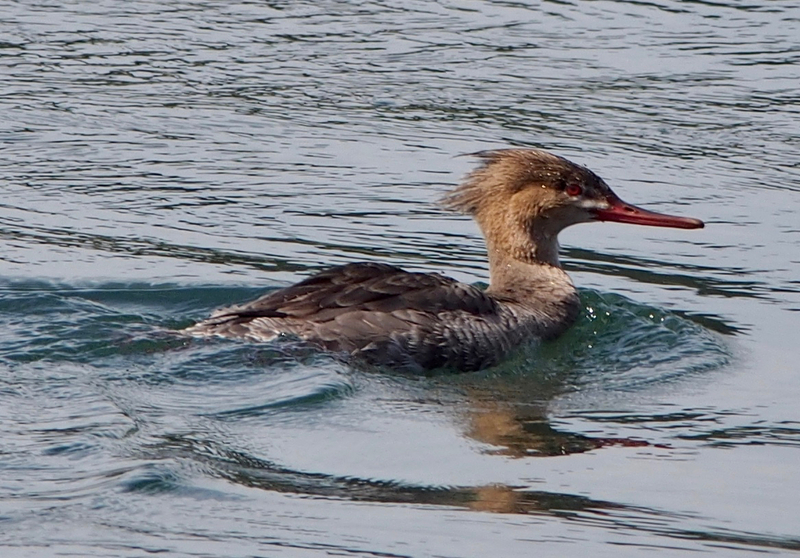 The red-breasted mergansers have been an exception to this because they have been consistently hanging out very close to the pier in a big group and I love the silhouette of their shaggy crested heads. 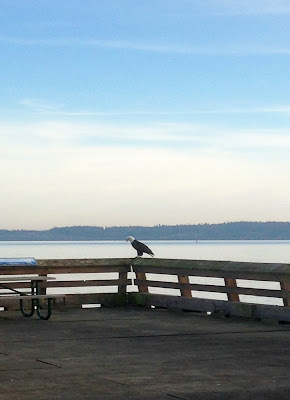 I am beginning to get used to their presence, greeting them with all the other wonderful birds on my walk down the pier. They have inspired me to be more curious and want to learn more about the other waterfowl in the area! Written by AmeriCorps Citizen Science Educator Lily Evanston. Articulation is the process of re-assembling an animal’s skeleton: bone-by-bone, joint-by-joint. Articulated skeletons provide an invaluable educational tool as they reveal much about an animal's form, function, behavior, and adaptations. Museum collections are a resource for educators, artists, and scientists. PTMSC’s articulated orca skeleton, Hope, on display in our Natural History Exhibit, is a great example! We have learned so much about her life and death from her bones. Last year while volunteering at the Burke Museum of Natural History and Culture in Seattle, I assisted with the articulation of a sea otter skeleton. Under the tutelage of skilled museum staff, I sorted the skeleton left from right, front from rear, and began piecing together all of the many hand and foot bones. I then drilled tiny holes into the ends of the bones where they jointed with neighboring bones. Wire was inserted and glued into the drilled holes to hold everything together.